If your dog has spent weeks, months, even years without having a potty accident, then suddenly dropped a log in an unexpected place… you might wonder if they pooped in your house on purpose. After all, they know better, right? The timing might make you suspicious. Maybe they had an accident right after you scolding them or they did not get their way. I believe you when you say you are observing these patterns. I think that living with an animal gives you a special power to understand their motivations and communicate with them in a nonverbal way. But sometimes, we rely too much on our experiences with humans when we judge our dogs. And if you’re dealing with the same issues over and over, you’re going to get frustrated. The only way to see a change, though, is to think differently about your relationship with your dog. Doesn’t My Dog KNOW It’s Wrong To Poop There? Even the most solidly potty-trained dog does not know that she has a moral obligation to keep your floor clean. Dogs don’t think poop is yucky. They think it is wonderful, useful, with a pungent aroma that is packed with information about the gifter. So, your dog will never understand that you hate cleaning up poop. She will never understand how embarrassing it is for it to appear when you have guests over. When you potty-train your dog, all she learns is that it is rewarding to go potty outside or on her pad. Successful pottying becomes a habit. Not a moral obligation. Not an act of compliance or respect for your security deposit. Please don’t take those random poops personally. People do dumb things to get revenge. Dogs are pure. They just don’t think that way, and that’s why we don’t deserve them. But if you’re annoyed, angry, exasperated… hang in there. This can be fixed so you and your dog can live together in happy harmony. And you won’t always have to pick up stray poops. Do Some Dogs Just Prefer Pooping In The House? 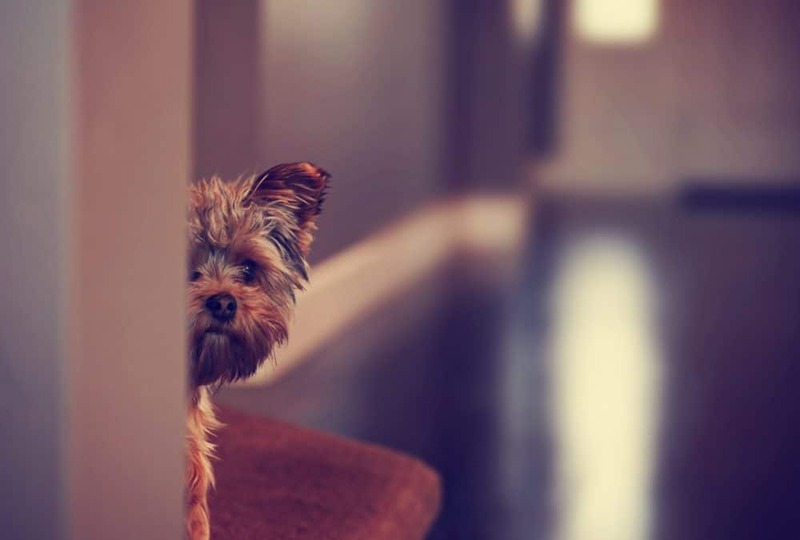 Some situations might make pooping indoors more comfortable for your dog. For example, your dog might only have accidents in the winter or during rainstorms. If you aren’t interesting in using potty pads part-time, you can teach your dog to poop outside in the snow. Comfort and convenience can make your dog prefer pooping indoors, so you’ll have to motivate her to change those bad habits. At first, it’ll be an extra challenge, but your dog can and will get used to going outside to poop, even if it’s a little uncomfortable for her. Who Isn’t A Nervous Pooper? You ever have an upcoming date or job interview, and spend the whole morning pooping every hour? Stress and anxiety cause spasms in the gut. This causes the contents of the bowel to move faster, causing that EMERGENCY POOP feeling. Dogs have a much shorter digestive tract than people. That’s why they seem to poop after every meal, or even more. Food moves through them really quickly. That handy biological trait plus anxiety can make a previously potty trained dog turn into nervous random pooper. That’s Why Dogs Don’t Poop For Revenge. I keep hearing stories of dogs who were told off, and then immediately went and pooped on their owner’s bed. The explanation seems pretty simple to me – your dog may even start acting up because they’re trying to get your attention to go potty. They might have targeted your bed because it’s drenched in the comforting scent of you… even if you’re not being very comforting to them at the moment. Events like these are just one reason why I advocate for positive training – punishing your dog, or in the case of small, emotionally unstable dogs (most Chihuahuas and many others) even raising your voice can cause enough stress to make your dog poop somewhere unusual. Don’t beat yourself up if you’ve ever yelled at your dog or overreacted to a poop. Dogs are imperfect, and so are people. They manage to love us anyway. You’ll do better next time, and so will your dog. First, consider a vet appointment. If it’s actually a pee problem, your dog will need to get checked for a urinary tract infection. How are your dog’s poops? They should be firm enough to roll around, not stick to the floor. A healthy poop is actually very easy to clean up and barely leaves a mark on the surface, though you’ll still want to disinfect the area. If your dog does not have any health issues, make sure that her favorite forbidden potty spots are completely clean. That means using an enzyme cleaner like Nature’s Miracle to break down any trace of a lingering scent. You can use crates and pet gates to keep your dog away from those forbidden areas. If you suspect your dog is anxious, you can try Tellington Touch Belly Lifts, a simple exercise that helps calm nervous dogs and those with digestive issues. There are a lot of variables when it comes to solving poop issues. You can leave a comment to discuss what’s going on with your dog. You may also want to enlist the help of a trainer or behaviorist who can figure out exactly why your dog is having accidents so you can find a real, lasting solution. My Small Dog Won't Poop Outside In The Winter... Is All Hope Lost? You’re so right, we Don’t deserve them, but thankfully we’ve been given the gift of dogs anyway! I learned by careful observation that when it gets super cold or there’s snow in the potty area, Phoebe can potentially have an “accident”. Now I put a sweater on her, time her potty breaks to ensure she goes Outside every few hours, and we shovel a patch of snow so she can potty in comfort. Works like a charm! Awesome post. Great info! Because I have senior dogs I’m always aware of any changes in behaviour. A perfectly housetrained dog that starts pooping indoors would definitely have me headed to the vet’s office. My youngest dog will occasionally have accidents inside if I don’t get him out in time. He’s funny, because he won’t ask to go outside, he’ll just resort to going on the floor. Luckily feeding and walking him on a pretty strict schedule has eliminated his accidents, for the most part. Timely, timely post – our little guy, Spike has turned 13 and has taken to showing no interest in going outside to take care of business. He has IVDD so I think his neck hurts and he no longer can use the doggy door – my husband was not so sure. Thanks for this info – it helps in our discussion! I’m not a dog person since I’ve always had cats and I must say dogs got cats beat in the lack of vengeful poop department. It happened to me once and only once and I’ll never forget. I have a few friends that dogs do use the wee pads to poop on when left a home during the day. It seems to work well for them when they aren’t able to walk them during the mid day. But of course they look forward to their evening walks when they get fresh air and can do their business outside the house. Kamira recently posted…Foster update: New year and New beginnings! I sometimes wish Layla would pee or poop on a pad but no such thing, when she needs to go she tells me and off we go outside. I never assume anything my dogs do are malicious- usually. Often I chalk it up to something medical and rule that out first. However, there is always an exception. Gonzo was about 7 months old and was house-trained. One day he got mad at me because I wouldn’t let him do something, he turned around walking over to the fireplace (the opposite direction of the door) turned back to look at me, and then peed. The cheeky little monster! That’s the moment when I realized he had dominance tendencies and upped my training. One of the downsides of seeing the relationship we have with our pets as one of “pet parent” is that tendency to see their behavior through our eyes – but they don’t think the same way. So peeing and pooping in the house isn’t an act of defiance or revenge. It is this kind of behaviour that gets dogs dropped off at the kill shelter instead of their parents looking at great blog posts like this. Great post! I know if Truffle or Brulee have improper elimination, I tend to check the litter box first. Sometimes, if it’s not cleaned quickly enough or a different litter is used, they will go outside the box. Otherwise, it’s off to the vet for them. When I was younger and living at home, my mother had a Poodle that was house trained, but when she was ignored or scolded, she’d do her business on the floor right where my mother left her bedside slippers, seemingly just so my mother would step in it! Sure seemed like it was revenge! LOL! But, most likely pooping where her slippers were because she knew she slid them on to let her out. Great post! Thank you for this great article! I had a fun time reading it. Dogs are such adorable and lovable creatures! I can’t imagine a life without them — they give us a sense of purpose and as science has proven they make our lives happier. Charlie Brown, my favourite corgi pet is such a culprit for leaving a mess in the house and he barks excessively when he sees new people. This post is really a great help for me. Amazing read! Thanks for the insightful post. My Chester has yet to do the business inside but as he gets older things may change.